Recruitment: it's a minefield. In between updating position descriptions, conducting interviews, checking references and negotiating salaries, how's a time-strapped not-for-profiteer to get any other work done? This book highlights the importance of taking a strategic, structured approach to recruitment, and walks readers through the process step by step, particularly as it applies to NFPs. 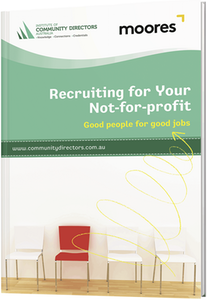 Co-written by Our Community and legal firm Moores, which has an inhouse team of lawyers dedicated to not-for-profits, the book explains how to undertake best-practice recruitment and avoid pitfalls such as discrimination claims. Specialist subjects such as recruiting a CEO, and recruiting volunteers and interns, are covered in detail. And sample policies and templates covering topics such as selection criteria, interviews, reference checking and induction are handy inclusions.